202 pages | 12 B/W Illus. As an ethnographic method walking has a long history, but it has only recently begun to attract focused attention. By walking alongside participants, researchers have been able to observe, experience, and make sense of a broad range of everyday practices. At the same time, the idea of talking and walking with participants has enabled research to be informed by the landscapes in which it takes place. By sharing conversations in place, and at the participants’ pace, sociologists are beginning to develop both a feel for, and a theoretical understanding of, the transient, embodied and multisensual aspects of walking. The result, as this collection demonstrates, is an understanding of the social world evermore congruent with people’s lived experiences of it. This interdisciplinary collection comprises a unique journey through a variety of walking methodologies. The collection highlights a range of possibilities for enfolding sound, smell, emotion, movement and memory into our accounts, illustrating the sensuousness, skill, pitfalls and rewards of walking as a research practice. Each chapter draws on original empirical research to present ways of walking and to discuss the conceptual, practical and technical issues that walking entails. Alongside feet on the ground, the devices and technologies that make up hybrid research mobilities are brought to attention. The collection is bookended by two short pedestrian essays that take the reader on illustrative urban walks, suggesting routes through the city, as well as ways in which the reader might make their own path through walking methods. 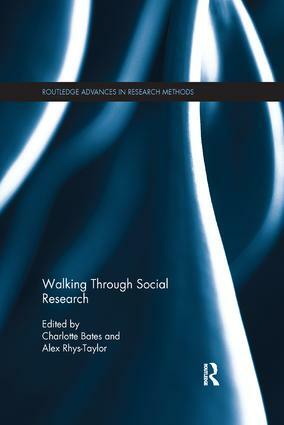 An innovative title, Walking Through Social Research will be of interest to undergraduate and postgraduate students, researchers and academics who are interested in Sociology, Geography, Cultural Studies, Urban Studies and Qualitative Research Methods. Walking Through Social Research is a poignant collection of essays that explores walking as immersion in city life. This rich and compelling collection engages with issues of violence, speculation and vulnerability, showing us how mis-steps, walk-alongs, air walks and walking together reach and reveal urban complexities. Bates and Rhys-Taylor offer an exciting collection of essays that take us on a variety of walks across a diversity of cities. This book is a timely contribution to the field of urban studies as it offers multiple reasons of why the practice of walking is essential to researching, knowing and reflecting on urban life. The essays are a pure joy to read as they offer a fine balance between theory, methods and empirical studies. An inspiring and fascinating read. Charlotte Bates is a Sociologist at the Cardiff School of Social Sciences, Cardiff University. Alex Rhys-Taylor is a Sociologist at the Centre for Urban and Community Research, Goldsmiths, University of London.